NBA 2K14 is a basketball video game that is available on several platforms. This version is conceived for iOS. The game is published by 2K Sports and developed by Visual Concepts. They agreed to let LeBron James of the Miami Heat to 1be the cover athlete. This app was first released on October 2013 and continues evolving. It is both a single-player and multiplayer game. Controls are simple to access thanks to a Dpad command. NBA 2K14 players have to go on Controller Setup for help to see and master all commands that are crucial for winning a game session. 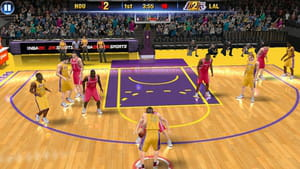 For instance, to perform sprint, players have to tap on RT and Y for a rebound. It is up to the gamer to choose his favorite basketball team. NBA 2K14 garners multiple gamers of NBA teams such as Miami Heat, New York Knicks and LA Lakers. Euroleague has recently joined the game introducing several athletes therein. For instance, we can cite team members of Alba Berlin, Maccabi Electra Tel Aviv and EA7 Emporio Armani Milano. NBA 2K14 is packed with over 50 hours of sports commentary that are played back with soundtracks. Player can enjoy the listening to famous play-by-play announcers such as Kevin Harlan, Steve Kerr and Clark Kellogg. NBA 2K14 is the best NBA video game franchise of the whole world. Graphics are gorgeous and appealing. The game now supports Simplified Chinese language. This latest version is fixed in terms of bugs. The game is very heavy. Latest update on April 19, 2016 at 04:34 AM.